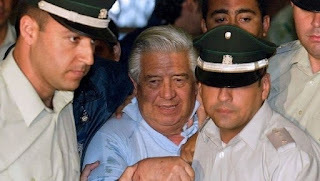 Santiago de Chile, Jul 11 (Prensa Latina) Four former agents of the 1973-1990 military dictatorship of Augusto Pinochet were sentenced by Judge Mario Carroza for the qualified kidnapping (disappearance) of Nestor Gallardo Agüero in 1974. Gallardo Agüero is one of the 119 victims of so-called Operation Colombo, an idea of DINA (Pinochet's secret police) to camouflage the disappearance of 119 political prisoners with the help of the dictatorships of Argentina and Brazil. Special magistrate Carroza, of Santiago Court of Appeals, sentenced retired general Cesar Manriquez Bravo, retired brigadier Miguel Krassnoff, retired colonel Orlando Manzo and retired Carabinero officer Ciro Torre to five years and one day in prison. Gallardo Agüero was shot in one arm with a gun and in any case was taken to a torture center directed by Torre and then to another headed by Manzo. He was a member of the Revolutionary Left Movement (MIR), auditor accountant, who was arrested in this capital on September 28, 1974.